There are multiple company files in QuickBooks. At a time, I can access only one company file. Is QODBC allow me to access multiple company files same time? To access multiple company files a user can create multiple DSNs, each DSN is setup to auto login to one company file. Please refer How to setup QODBC for auto-login into QuickBooks. If you want to access different company file, just change the DSN name to the one point to that company file. Please make sure QODBC has got permissions from all company files. A user needs to start QuickBooks, Login to company file as Admin, Single user mode, and connect to that company file using VB Demo/User Applications, It should popup a certificate, and user needs to accept the certificate so that QODBC can access company file data. This activity should be done only single time, for each company file. After accepting certificates from all company file using MS Excel and dump the data into spreadsheets for each company in sequence and then merge the sheets. Please Note: QuickBooks SDK can access only one company file at a time. As a workaround, You can use multiple machines, each machine having QuickBooks and QODBC installed. Each machine will have different QuickBooks company file opened in QuickBooks application. 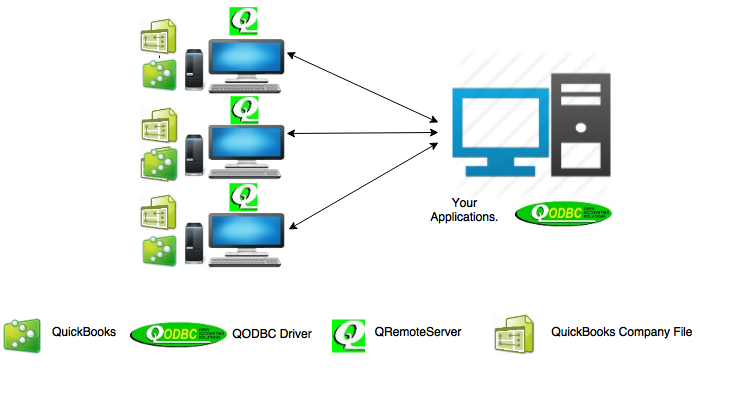 Application machine uses QRemote Client (different DSNs) to connect to those machines and accessing QuickBooks company file data simultaneously. QRemote Client DSN A --> Points to IP Address of Machine A --> Machine A will have QuickBooks company file A opened. QRemote Client DSN B --> Points to IP Address of Machine B --> Machine B will have QuickBooks company file B opened. QRemote Client DSN C --> Points to IP Address of Machine C --> Machine C will have QuickBooks company file C opened. This is unfortunate. I wanted to access all my company files at once in Access to export a consolidated transaction list. Please tell me there is a way. I am currently using the free version for QB Enterprise. There is a limitation with the QuickBooks SDK that it can connect only 1 company file at a time on a machine. To access all company at a time you need to use multiple machines, each machine having QuickBooks Installed and logged in to different company file. 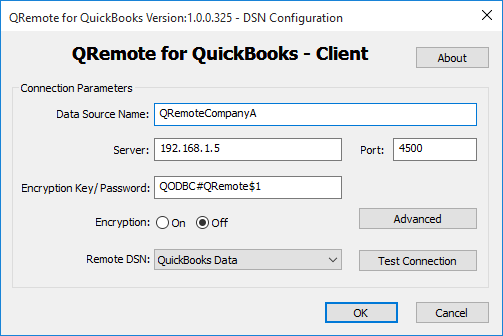 Application machine uses QRemote Client (different DSNs) to connect to those machines and accessing QuickBooks company file data simultaneously. Thanks. There are only two of us at work with QB and we have over 40 company files so the above option is not available to us.